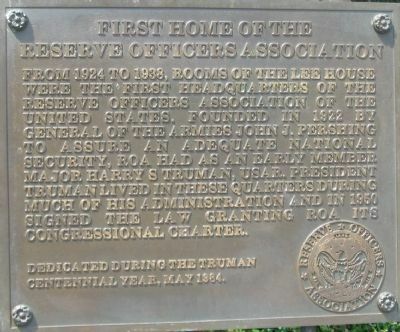 From 1924 to 1938, rooms of the Lee House were the first headquarters of the reserve officers association of the United States. Founded in 1922 by General of the Armies John J. Pershing to assure an adequate national security, ROA had as an early member Major Harry S. Truman, USAR. 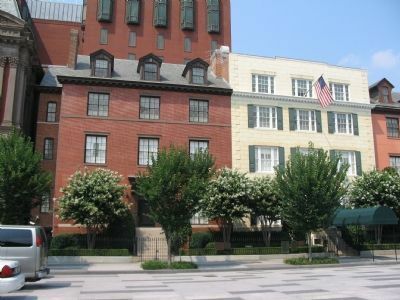 President Truman lived in these quarters during much of his administration and in 1950 signed the law granting ROA its congressional charter. Location. 38° 53.933′ N, 77° 2.322′ W. Marker is in Downtown, District of Columbia, in Washington. Marker is at the intersection of Pennsylvania Avenue and Jackson Place, on the right when traveling west on Pennsylvania Avenue. Touch for map. In front of the Blair-Lee House. Marker is at or near this postal address: 1651 Pennsylvania Avenue, NW, Washington DC 20005, United States of America. Touch for directions. 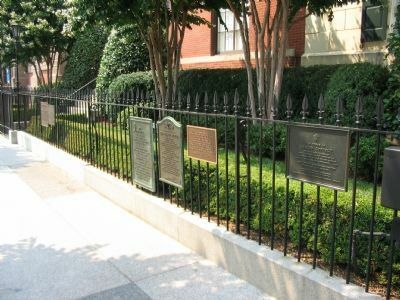 few steps from this marker); In Honor of Leslie Coffelt (a few steps from this marker); a different marker also named The Blair House (a few steps from this marker); The Entrance Gardens (a few steps from this marker); Renwick Gallery (within shouting distance of this marker); These Five-Inch Brass Trophy Guns (within shouting distance of this marker). Touch for a list and map of all markers in Downtown. More. Search the internet for First Home of the Reserve Officers Association. Credits. This page was last revised on June 16, 2016. This page originally submitted on December 8, 2007, by Craig Swain of Leesburg, Virginia. This page has been viewed 1,379 times since then and 6 times this year. Photos: 1, 2, 3. submitted on December 8, 2007, by Craig Swain of Leesburg, Virginia.